The ancient Cretans, known as “Minoans” today, created a far-flung shipping and trade network with Europe, Africa and Asia. They built grand public buildings (palaces) with beautiful wall paintings, colorful stonework, light wells and sophisticated plumbing. However, after more than a century of digging up Minoan artifacts, archaeologists are still trying to explain who the Minoans were and how their society was organized. This is the main focus of a project started in 2007 near Sissi (pronounced “see-see”), a small fishing village on Crete’s north coast. 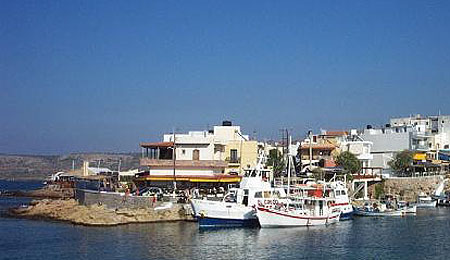 Sissi is a small fishing and farming village near the Palace of Malia. 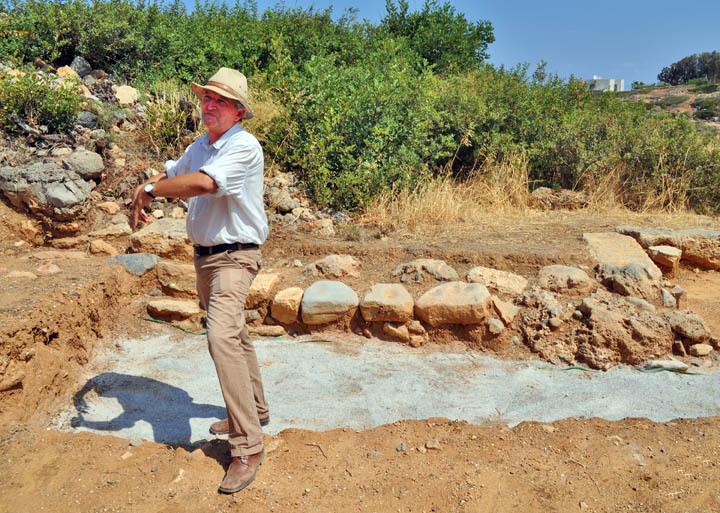 On our first visit to the excavation site, located on a seaside hill called Kefali, we found it fenced and locked. Luckily, we were later invited to attend an on-site seminar hosted by Professor Jan Driessen, the project director. Arriving at the site entrance, we found a large group of people, including some well-known archaeologists interested in learning about the progress of research. Dr. Driessen described the structure and orientation of Sissi building. Sissi is within walking distance of Malia (one of the great palace complexes on Crete). Therefore, one might assume Sissi served the ruler of Malia. 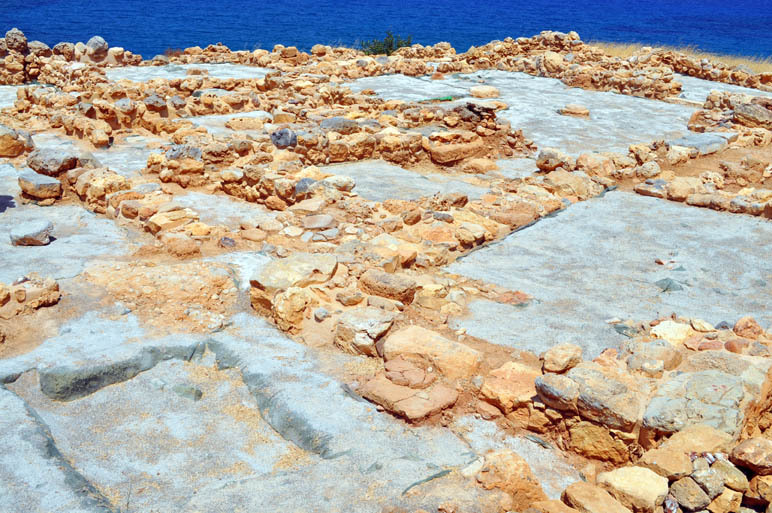 However, like other Minoan palaces, Malia was supported by farms and villages that produced food supplies and manufactured goods to fill the palace store-rooms and treasure-houses. Some of these products were consumed, and others were shipped out as trade goods to other countries. However, Sissi was certainly not a peasant farmstead supporting the ruling class. 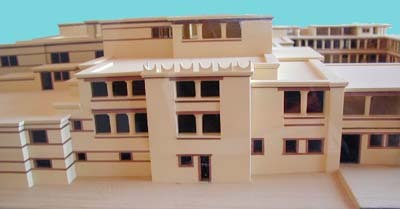 Scale model of Malia’s main palace buildings. Why did Sissi exist, and what was its purpose? Who was in charge at Sissi? What was the relationship between Malia and Sissi? These are the sort of questions the Sissi research team hopes to answer. Study of the technology, production and use of material culture (pottery, architecture, stone and metal objects) at Sissi is starting to reveal much about the social, economic and political life of those who lived there. In addition to traditional excavation techniques, the team is using high-tech 3D scanning equipment, ground-penetrating radar, and aerial photography to record both topographical and archaeological features. Electronic data are then organized in a computer, which makes it easier for researchers to access data and images. 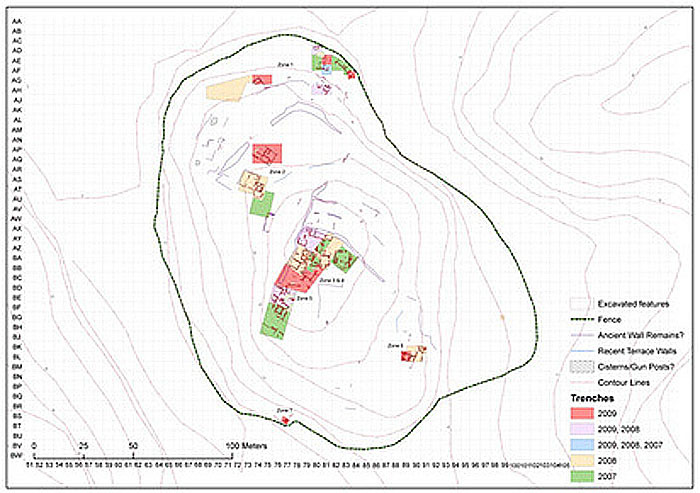 Computer drawing of the Sissi site, with technical data. Dr. Driessen guided us through the Sissi excavation, describing the architecture and purpose of the buildings and artifacts uncovered during excavation, and answering technical questions asked by archaeologists in the audience. Dr. Driessen explains the functions of the various areas of Sissi. An impressive area of the “mini-palace” was the reception hall and related rooms, where visitors would have meetings and enjoy banquets with the lords (or managers) of Sissi. Here we could see the bases of stone columns that supported the high ceilings and upper floors. Beyond stone thresholds were storerooms and a kitchen where food was prepared for guests. From this part of the complex we could look down to the harbor, where Minoan ships once moored. Main meeting rooms and banquest hall of the Sissi complex. Several excavation campaigns have revealed a settlement occupied between 2600 and 1250 BCE, and a large cemetery used between 2600 and 1750 BCE. The cemetery, located below the “palace” and just above the shoreline, is in poor condition. Many centuries of human activity and erosion by the sea, rain and wind have uncovered many of the graves and destroyed artifacts. In some places, the bones of ancient Minoans are visible on the surface. 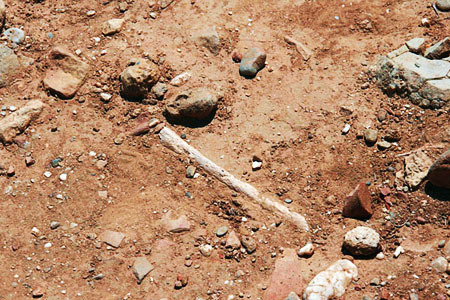 Bones of an ancient Minoan can been see on the surface in the cemetery. Why did this place endure for so long, even after the palace of Malia itself was abandoned? 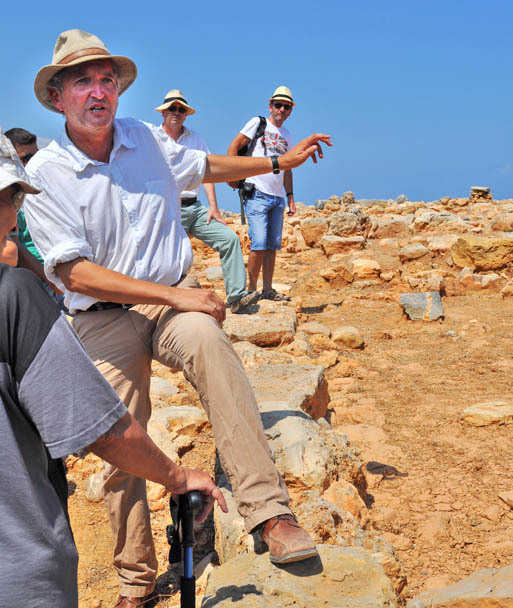 Dr. Driessen believes the rulers of Malia chose this hill at Sissi for strategic reasons. With steep slopes on three sides and the sea on the fourth, Kefali hill could be easily defended. 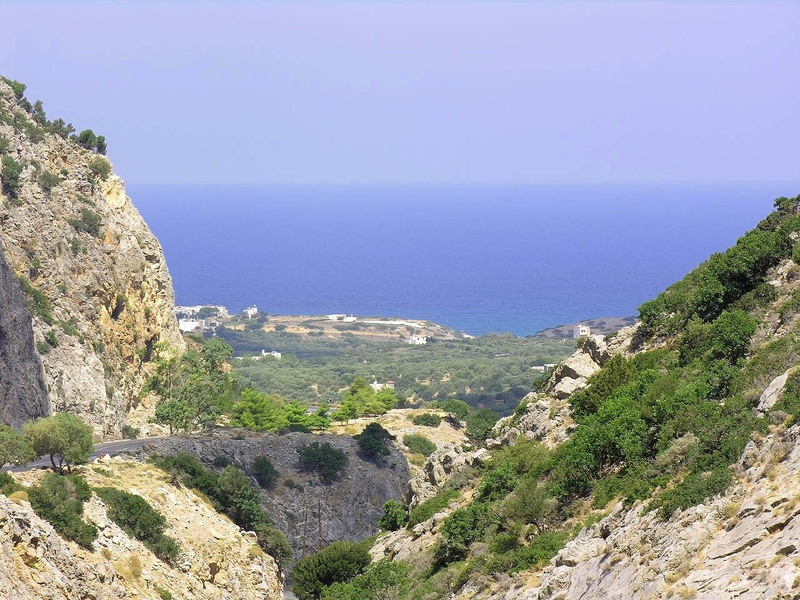 Also, the hill guards the only mountain pass between Malia and the eastern regions of Crete. This gave Sissi a unique a special defensive and commercial advantage. In addition to controlling the mountain pass (now called Selinari Gorge), Sissi had its own protected harbor and easy access to the beach at Milato. Both of these might have served as extra shipping ports for Malia (which is also located on the sea shore). In other words, Sissi may have operated as a sort of “way station” handling security, cargo transfer, and perhaps tolls at import-export routes to Malia. Who might have been in charge of such an important center? Perhaps they were trusted Malia administrators and military leaders. 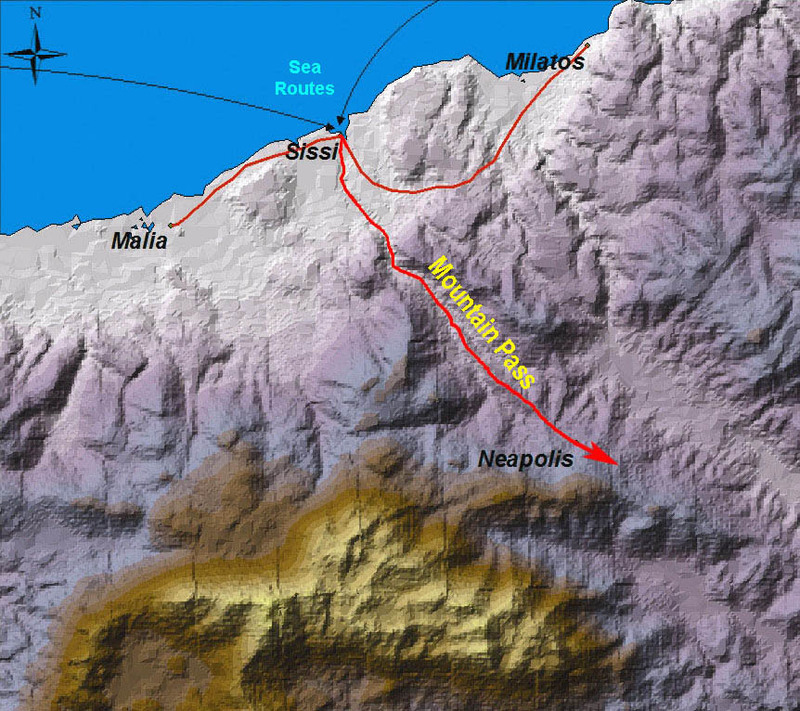 Sissi controls the sea and mountain pass routes to Malia. After the decline of Malia, Sissi was still important to those who wanted to regulate trade and security in central Crete. The Greeks, who came after the Minoans, controlled Selinari pass and (at Gournia) trade routes from the south coast. Over the centuries, many rulers (the Romans, Byzantines, Venetians and Ottomans) tried to manage shipping and trade. Even the German military established a base at Sissi (with an artillery emplacement just below Kefali hill) to defend against Allied ships during World War II. Direct view from the mountain pass to Sissi and Kefali Hill.